Join Social Circle and visit some great fantastic countryside. Meeting by the clock outside Tesco, Parrs Wood, East Didsbury, M20 5NP. The Clwydian Range is a series of hills and mountains in north east Wales with the popular Moel Famau (1,818 ft) at its highest point. The summits of this range provide extensive views across north Wales, to the high peaks of Snowdonia, eastwards across the Cheshire Plain, Peak District and towards Manchester and Liverpool to the northeast and the range is designated as an area of outstanding natural beauty. Foel Fenlli (1,677 ft) is the second highest peak of the range and contains the remains of a hill fort believed to date back to the Iron Age. 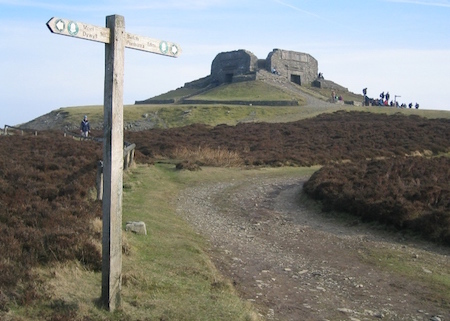 Moel Famau is also surrounded by several well-preserved Iron-Age hill forts and has been classed as an Area of Outstanding Natural Beauty since 1985. 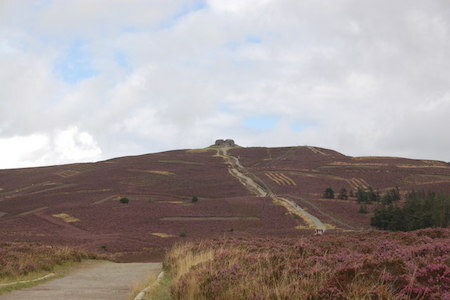 A northern part of the Offa's Dyke footpath, one of the UK's most popular National Trails, crosses the summit of Moel Famau and the Jubilee Tower, which was built to commemorate the golden jubilee of George III in 1810. It was designed to look like an Egyptian obelisk with three tiers and was never completed due to a lack of funds. The remains of the tower mark the highest point in the park from which weather permitting one can look out onto Isle of Man and as far as Cumbria and the Irish Sea windfarms. We will start and finish our spring walk at the car park at the Loggerheads Country Park and after the day well spent we will celebrate with a well deserved pint and a Sunday roast at the “We Three Loggerheads” inn. Kit list: warm clothing, fleece, scarf, hat, gloves, walking boots (no trainers), walking trousers (no jeans), thermals, waterproofs, gaiters, tea flask/water, packed lunch.